Children Podiatry Adelaide—The Peace of Mind You Deserve! What’s Different About Children’s Podiatry? When it comes to children podiatry Adelaide, you need a team who demonstrate care and vigilance in their approach. AC Podiatry are highly experienced in working with children, and we’re happy to provide practical solutions for all your concerns. It’s important to note that children go through development at their own pace. The progress from lying, to sitting, to crawling, to standing, and finally to walking can take anywhere up to 24-months. During this period of their lives, children’s feet are soft and flexible. Unfortunately, this increases their susceptibility to deformity and damage. 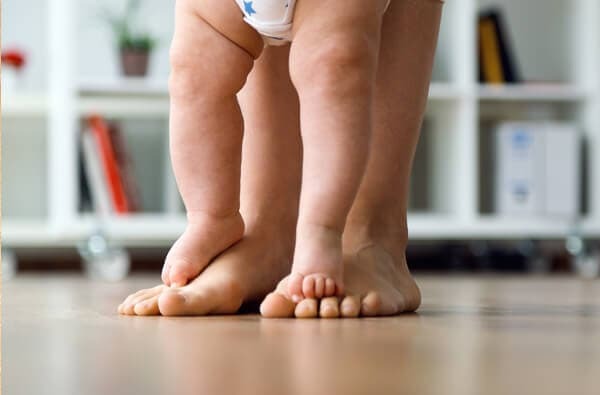 AC Podiatry will track the development of your child’s feet and offer advice to ensure growth is uninterrupted. A child’s foot is generally half their adult length by 18 months of age, which is an indication of steady growth. However, bones aren’t fully developed until around 18 years, which is why choosing adequate footwear is important. We’ll provide you with all the insight you need on children podiatry Adelaide! With our experience in children podiatry Adelaide, there are few things we recommend to facilitate healthy growth. Don’t ever put children in restrictive shoes—particularly when they’re babies. Footwear should always be measured in both width, and length. Shoe sizes will gradually increase as your child develops, so make sure you re-measure to maintain an adequate fit. There should be 10mm of growing room from the end of your child’s big toe. Footwear should also be comfortably shaped to the foot, so it’s worth spending the extra dollars for a quality pair. If your children are younger than 48-months, we advise keeping their feet unconstrained when indoors. This helps with muscle development in the feet and legs, enabling them to kick around and get their bearings. Drying feet properly is also important to deter bacteria growth. For more advice on children podiatry Adelaide, come to our clinic for a consultation. Heel pain in particular is quite common in growing children, as they begin to actively participate in more sports. If the problem is limiting the child’s want/ability to move, it could be related to Sever’s disease. Despite the intimidating name, this issue is easy to fix with plenty of rest, and ice packs for swelling. Growing children are equally as susceptible to warts due to their less robust immune system. AC Podiatry have plenty of treatment solutions, so trust us to take care of your children podiatry Adelaide! To book your first consultation with the team at AC Podiatry, give us a call on (08) 8255 5575. We love working alongside kids and giving parents the peace of mind they deserve! We have solutions for just about any problem, so choose us for your children podiatry Adelaide and receive a comfortable, stress-free service.